Virtually every homeowner has experienced damage to their landscape plants from the extreme winter of 2013-2014. From the ice storms to the extreme cold, Bucks County and the surrounding area has seen unprecedented damage to trees and shrubs. Trees in the forest have been broken apart or completely toppled, such as Red Oaks, Sugar Maples, and Ash. After the cleanup, there will remain the assessment of damage to wind-burned, broad-leaf evergreens. 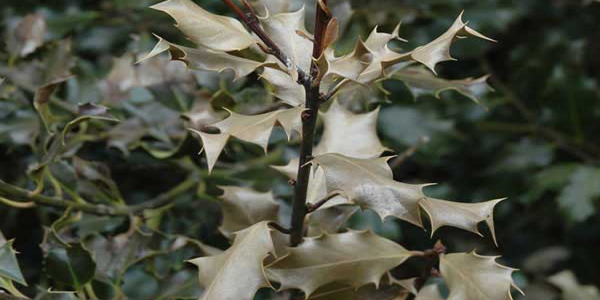 Especially vulnerable are those plants that are on the edge of the hardiness zone for southeastern Pennsylvania; Cherry Laurel, Mahonia, Southern Magnolia, and some varieties of Azalea, Rhododendron, and Holly. While the winter’s snow cover helped to protect the roots of these plants from freezing and fluctuating soil temperatures, the extreme cold and sun reflecting off the snow has caused damage to the foliage. This damage will often be enough to cause die-back on branches, or even so much damage that the affected plant must be replaced. Pruning of the damaged branches should be completed as soon as possible, so that the plant has time to recover and push new growth. Flowers may be sacrificed on those plants that require pruning and bloom on the previous season’s growth.